Once Ella expressed such enthusiasm though, the Osbornes looked into the specifics of this pageant further. They learned that it isn’t just about smiling on stage. It’s about representing and making a difference in one’s community, and it’s about older girls mentoring younger girls. 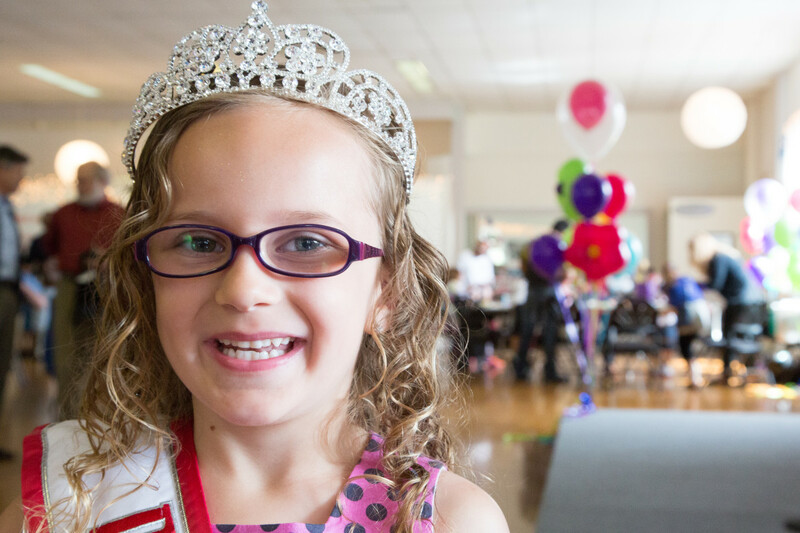 Ella took that risk, and this past May, just one day after her sixth birthday, she was crowned state queen in the Princess Division. She will go on to compete in the national competition this November at Disneyland. Ella sees success through her glasses, glasses that are as much a part of her as her hands and hair, her mom says. Ella’s pediatrician discovered a cataract in Ella’s eyes at her three-month appointment. DeDe shared that she felt a little sad when her daughter was diagnosed. “I didn’t want her to start out with any challenges or to feel different.” She had to wear a patch for thirty minutes every day and received her first pair of glasses at age two. Since that day, glasses have been a beloved part of her identity. Because of Ella’s personal experience, it was simple to choose a community-enhancing program for which she felt passionate. Ella’s mom contacted Joannah Vaughan at the Casey Eye Institute to see how Ella could support other children with vision challenges. Through See to Read, a program funded by donations from the Oregon State Elks, children ages three to seven receive free vision screenings. Visit seetoread.net for a list of scheduled screenings. Luckily, Ella’s eye condition was detected early, so it has not negatively impacted her learning, but 15% of children ages three to five have undetected vision problems. This poses a serious roadblock since 80% of learning in the first twelve years of a child’s life comes through vision. According to Vaughan, many vision disorders can be treated and even reversed, if diagnosed within this critical window. Ella knows firsthand the joy that reading can bring. She learned to read last year, and enjoys reading to her little brother. “I’m happy when I get to read to other kids and make them happy,” Ella explains. 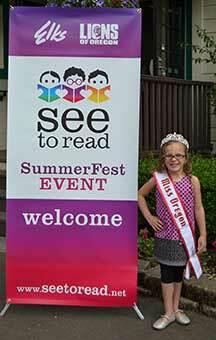 I met Ella and her mom at Poppa Haven’s Coffeehouse to talk about the pageant and See to Read. She told me that she loves helping other kids feel okay about wearing glasses. She also enjoys her involvement in the pageant for all the friendships she’s made with sister queens. When not participating in pageant-related activities, Ella likes swimming, looking for bugs under rocks, “but not the heavy rocks” and taking dance classes at Elite Dance Studio. Her favorite color is rainbow, which is not surprising for such a vibrant little girl! Children ages 7 and younger who need their vision checked before school starts can get a free screening this weekend. The Eugene and Springfield public libraries are holding several vision screenings for 3- to 7-year-olds, starting Saturday. The state Legislature last year passed a law mandating eye tests for children 7 and younger entering public school or a prekindergarten program. At least 15 percent of preschoolers have an undetected vision problem that needs to be treated with glasses, said Joannah Vaughan, director of the preschool vision screening program at Elks Children’s Eye Clinic, a part of Oregon Health & Science University’s Casey Eye Institute in Portland. The screenings are intended to determine whether a child has nearsightedness or farsightedness — eyesight problems that can develop into ­amblyopia, a common vision disorder known as lazy eye. The disease is the most common cause of blindness in adults, Vaughan said. More than 11,000 Oregon preschoolers may have amblyopia, she said. Doctors can successfully treat children with lazy eye before they reach the age of 7, said Vaughan, who has advocated for mandatory preschool vision screenings since 2003. The ideal time for children to have a vision screening is at age 3, she said. Eighty percent of learning happens through the visual system, Vaughan said. Children who need glasses can be at least two years developmentally behind their peers, she said. The Elks Children’s Eye Clinic, the Oregon State Elks Association, Oregon Library Association and the Oregon Lions Sight & Hearing Foundation partnered to organize the free screenings for children, to be held across the state at public libraries for the next several months. Vaughan said the goal is to screen half of the 45,000 children who will enter kindergarten in September. At least 40 public libraries in the state have agreed to host the screenings, she said. While not free, screenings also can be arranged by parents with an ophthalmologist. All children who are screened will be given a proof-of-vision-screening certificate. Children who do not pass the screening will be referred to an eye doctor for a dilated eye exam. If a student fails to provide proof of an eye test, the public school or preschool program can withhold report cards, according to the law. Schools cannot prohibit children from attending classes if they haven’t been screened. Bethel Branch Library (in English and Spanish): Saturday, 10:30 a.m. to 12:30 p.m.
Sheldon Branch Library: Aug. 14, 2:30 p.m. to 4:30 p.m.
Springfield Public Library: Saturday, 12:30 p.m. to 2:30 p.m.; Aug. 14, 11 a.m. to 1 p.m. 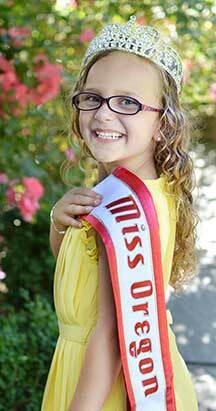 When asked by her mom to take off her glasses for a picture, 6 year old Ella Osborne, who was crowned Miss Oregon Princess at the National American Miss pageant this past May, simply replied, “Mother, I have to be myself. And who I am is wearing glasses.” Ella says she loves wearing her glasses and the only time she doesn’t like wearing glasses is when she forgets to take them off before she falls asleep. Ella was diagnosed with a cataract, an eye disorder that causes vision to become clouded and blurred in one or both eyes. At three months old she underwent patch therapy for thirty minutes a day until the age of two when she was prescribed glasses. Ella’s vision disorder was detected at an early enough age that has allowed for successful treatment. She has been able to progress, in school and at home, despite having an eye disorder that threatens child development, especially during the critical preschool age. 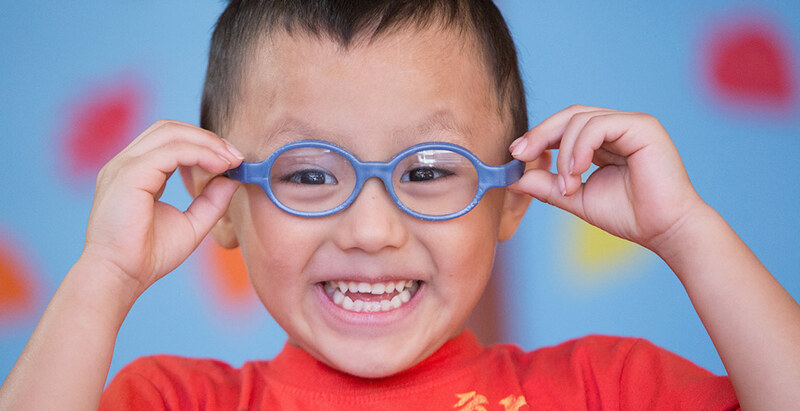 Early vision screenings for children are essential, as 80% of learning in the first 12 years comes from vision. This upcoming November Ella will represent the state of Oregon in the National American Miss pageant in Southern California, where she also hopes to visit Disneyland. She enjoys hunting bugs with her younger brother Beckett, playing sports like soccer and baseball, and taking dance lessons in ballet, jazz, and hip-hop. In her role as American Miss Oregon, Ella is asked to make a lot of public appearances. Osborne says her daughter has a strong sense of self because of her glasses. She has been able to find confidence because of her differences, which her mom is grateful for. Every activity Ella has done, from dancing to rock climbing, gymnastics, horseback riding, theater, and competing and winning the National American Miss pageant, have included her glasses. Check out the great feature on Oregonlive.com featuring fantastic coverage about the See To Read kick-off event and a terrific video. Oregon Elks, Lions and public libraries are working together this summer on “See to Read!”– a program offering free vision screenings for preschool children at libraries across the state. Thank you to all the children and families who came out for a great day of fun!